Episode 7 is a really good episode; perhaps my favorite one so far. Many things happen in this episode including our female lead having to decide what is worth it and what isn’t. Whether she and Tae-soo are genuine and honest with each other or if their whole relationship is just her imagination. In the beginning of eipsode 7, Ji-hoo continues to remain in total disbelief and shock from seeing the picture of Manager Im and Tae-soo kissing. Not too far away, Manager Im stands at the bedroom door explaining the relationship she once had with Tae-soo. She explains, “Manager Oh and I were doing so well at that time…we have a history you don’t know about.” Manager Im then places her hand on her heart and voices, “Here in our memories.” She chuckles to herself before continuing, “Is it because I’ve aged? I see our memories and our Tae-soo under a new light.” Manager Im adds that she’s going to do well with Tae-soo; she has no intentions of giving up on him anytime soon as evident when she also reveals that she’s already considering marriage with him. Ji-hoo just excuses herself and leaves, bewildered. We see Tae-soo in his apartment looking and acting really cute because he has just finished taking a shower. He calls Ji-hoo to catch up on what she’s doing. Meanwhile, we go back to Manager Im who’s in her room cleaning up the mess Ji-hoo left behind. Her eyes land upon the picture of her and Tae-soo kissing which causes her to recall that moment. In the flashback, Manager Im and Tae-soo are kissing due to a game that they’re playing with their friends at her birthday party. After they’re finished kissing, Tae-soo reveals that Manager Im would always be like a Nuna to him; he can’t ever see her as a woman. We then return to the present where Manager Im is in her bedroom, thinking about that special memory that she still remembers vividly despite a few years since it’s past. Ji-hoo waits at the bus stop, her mind filled with many thoughts and doubts regarding Manager Im and Tae-soo. She receives a phone call from Tae-soo, but doesn’t pick up. The next morning at work, Tae-soo spots Ji-hoo in the work building and calls her name. But Ji-hoo ignores Tae-soo’s call and runs towards another employee. She walks off, not responding to Tae-soo. 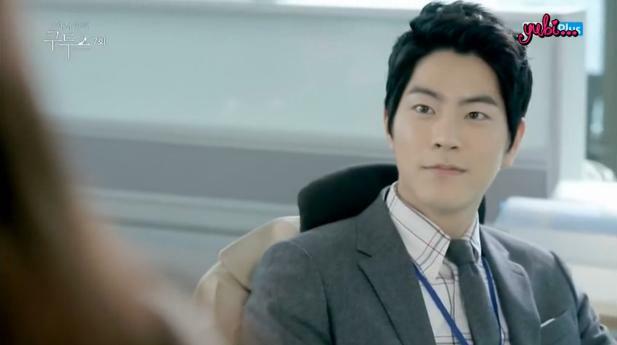 Later on that day, Ji-hoo walks past Tae-soo’s desk where they glance at each other before she walks off. When she doesn’t speak a word to Tae-soo, he grows suspicious and a bit sad. (HOW DOES ONE NOT SAY HI TO THIS BEAUTIFUL FACE?! I DON’T GET IT). A few hours later, Tae-soo is passing our coffee to all the employees. 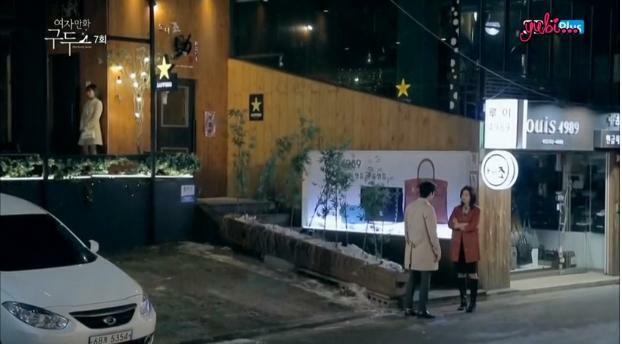 He runs across Ji-hoo and even calls out her name again, but she doesn’t respond and walks away. Tae-soo’s mind is so occupied by Ji-hoo that he doesn’t hear his name being called by his boss until his name is called repeatedly. Tae-soo and Ji-hoo’s department end up having a gathering that evening. Ji-hoo watches as Manager Im and Tae-soo interact with each other while she sits across the table. The two employees from the earlier episode that gossiped about Manager Im and Tae-soo possibly dating are also at the gathering and express their thoughts on how compatible and good Tae-soo and Manager Im look together. The boss also agrees with them and assumes that the both of them are dating. The episode ends with Ji-hoo standing not too far away from Tae-soo and Manager Im and overhearing all of this. So I know that in the past few recaps, I haven’t been writing down my thoughts on the episodes and drama and that’s just because I don’t feel the need to write anything down. But as many things happened within this episode, there are a few things I need to note. I’m extremely happy that Tae-soo confronted Manager Im and explicitly told her that he doesn’t want to be with her anymore and rather prefer to be with Ji-hoo. He’s willing to give it a try with her even if it doesn’t work out in the end. I think usually when a situation like this happens, the male lead tends to just go along with the plan until the very last minute of the very last episode where he finally realizes who he truly wanted to be with which was the female lead all along and then goes back to the female lead. I’m glad that Tae-soo confronted Manager Im that very evening instead of waiting and thinking. He knows who he loves; he knows what he wants and he’s going to fight for it. I love that honesty and courage, because it demonstrates Tae-soo’s integrity and wise decisions. I was also happy to see that he was trying to reach out to Ji-hoo despite getting rejected by her multiple times in this episode. It is evident that he genuinely cares about her, hence his many tries to interact with her, and I love seeing that about Tae-soo. As someone who can be depicted as every woman’s crush, the fact that he chose Ji-hoo says a lot because he’s willing to go after her at all lengths. Ji-hoo is obviously over thinking everything and the past and this is affecting her relationship with Tae-soo. I don’t blame her for becoming doubtful and afraid of the future. Just knowing that there’s someone who is threatening her relationship with Tae-soo is a scary thing; you never know what to expect. I think it especially got to her, because she liked Tae-soo for so long and tried so hard to win his attention, interest, and heart, and when she finally did get to be with him, something as bad and scary as this occurs. After hearing about how Tae-soo only wishes to be with her, now all that has to happen is for Tae-soo to convey those very same words to Ji-hoo herself. Face to face. Spitting out only the honest truth. Once we have that confrontation between Ji-hoo and Tae-soo, everything shall be better. They can go back to like how they were in the beginning of the drama and continue on their journey to happiness.